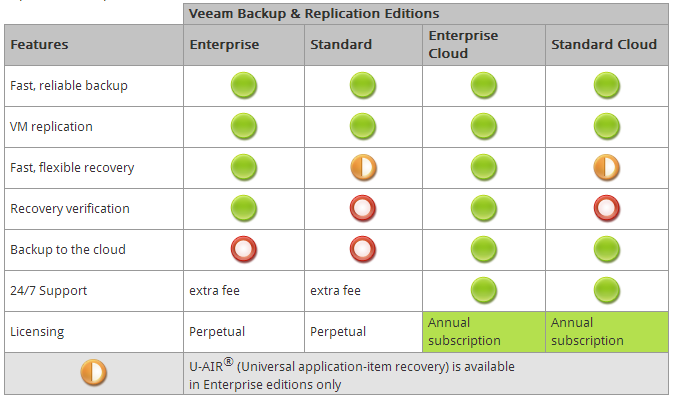 Veeam have been playing a bit of a teasing game with its customers over the past few months. It’s been an exciting game as month by month new features have been unveiled, whetting the appetite of Veeam fans everywhere as they eagerly awaited the next slice of awesomeness to be revealed. Each feature added to Veeams already extensive feature set. I will say up front that I’m biased here as I use Veeam quite a lot and have seen it mature from being the only option for SMBs to tickling the feet of Enterprise companies. As the months went by the features became more impressive, from integration directly to vSphere Web Client, to SureBackup for Hyper-V, to SureReplica in VMware to Native Tape Backup Support. 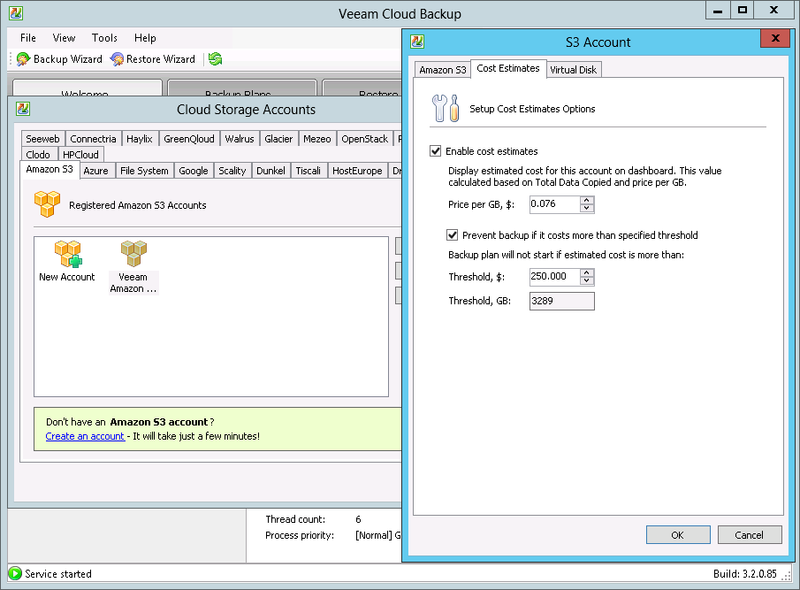 Yes you read that correctly, Veeam now supports backup to tape. No more need for agents to backup to tape or having another backup product to archive your data to tape for off-site storage. This will all be taken care of within one console. But even these features don’t match the two announcements back on the 16th May. 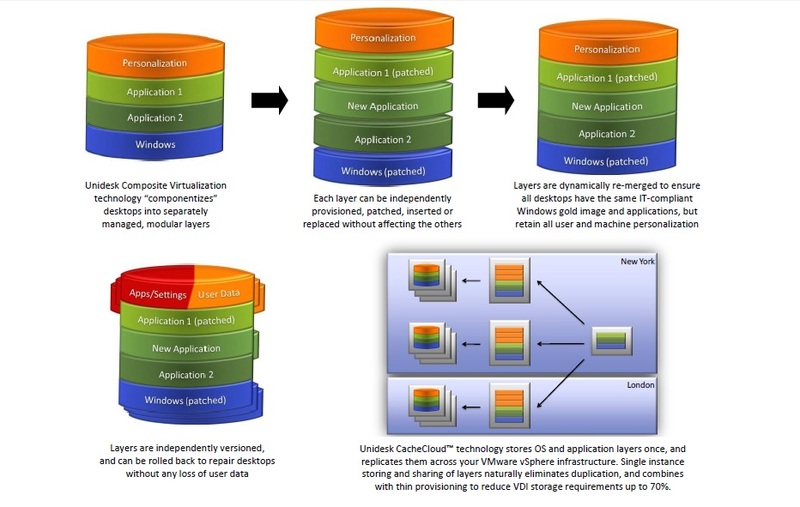 Veeam has integrated with HP storage (LeftHand, 3Par, StoreVirtual VSA) to allow backup from Storage Snapshots, which greatly reduces the backup time, and a built-in WAN-Accelerator to increase the speed of off-site backups by up to 50%. These two features, with the WAN-Accelerator in particular, have pushed Veeam into the realm of truly viable Enterprise Backup Solutions. So, I’ll give a run down of the features as they were released by Veeam. The web client for vSphere released in 5.1 is being pushed heavily by VMware and it will gain more traction over time. The upside is that is allows for plug-ins from 3rd party apps. And Veeam have taken full advantage of that. The web client allows VMware and Veeam admins, usually one and the same person, to easily manager both their virtual infrastructure and virtual backups all from one console. 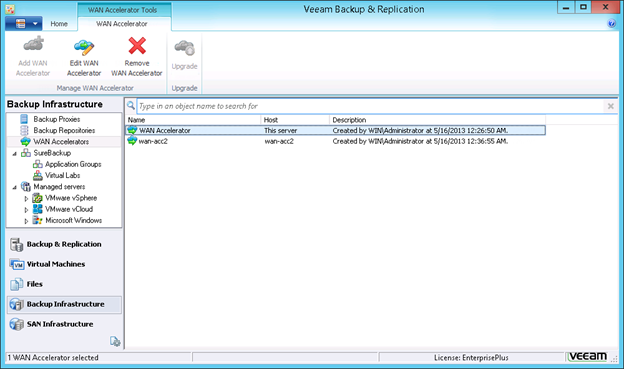 There is no need to have to log into the Veeam console as well as your vSphere client separately. It’s all now in one easy to use console. This is a feature that was requested from Veeam clients, and while the web client popularity has not gained too many followers, when it does Veeam will already be ahead of the game. Once again, as with all things Veeam, it’s easy to configure. This is probably the one feature that I’ve been least interested in. Partly this is due to the fact that Veeam could already recover Sharepoint objects with relative ease. They have leveraged the highly successful Veeam Explorer for MS Exchange that quickly cracks open backup files to allow users to browse for emails and made a similar explorer for Sharepoint to quickly and easily allow the recovery of Sharepoint files. The ability for Veeam to open a compressed, deduplicated backup file through an explorer window is extremely impressive to watch. There is one drawback, it can’t do full site recovery. That I can assume will be in version 7.x or 8. Virtual Lab, or SureBackup as it’s also known, has been a solid feature of Veeam running on VMware for a few version now and it’s great to see that expand to Hyper-V. I’m not going to go into SureBackup and Virtual Labs too much, they’re a massively great topic on their own, but the fact that both VMware and Hyper-V can leverage the sandboxed VM restore feature of Veeam just goes to show how Hyper-V is maturing and deserves some attention from 3rd party software vendors. Veeam recently received a patent for its vPowerNFS software intelligence and has utilized that within Hyper-V to allow testing of VMs and also testing the validity and consistency of Veeam backups in a sandboxed environment, all running from backup storage. Genius! I should not have been as excited as I was when I heard that native tape support was a new feature of Veeam version 7. It may not seem like such an advanced feature to most people that currently backup to tape but it’s been a bit of an Achilles heel for Veeam for a long time now. It’s always been an issue for customers that still trust tape for long term archiving to be able to easily backup their VMs in Veeam but then have to use another product to backup to tape. This normally involved having to pay more license fees for another product and any agents that were required. This massive pain point has finally been dealt with. Archive to tape in Veeam supports virtual tape libraries (VTLs), tape libraries and standalone drives. Basically, if the OS can detect the drive then Veeam can write to/from the device. The other great feature is that you can restore directly from tape back into Veeam without having to stage the data first. If I’m honest I didn’t necessarily see the value of this straight away. I quickly overlooked it as a new feature but on second viewing it’s an awesome little feature. 1-click restore uses the Enterprise Manager console, run on IIS, to allow end users to be able to restore files on a self-service basis, which is one of the tenets of the Private Cloud model. I think this will become a really useful feature for customers that really want to go toward the fully self-service IT model. 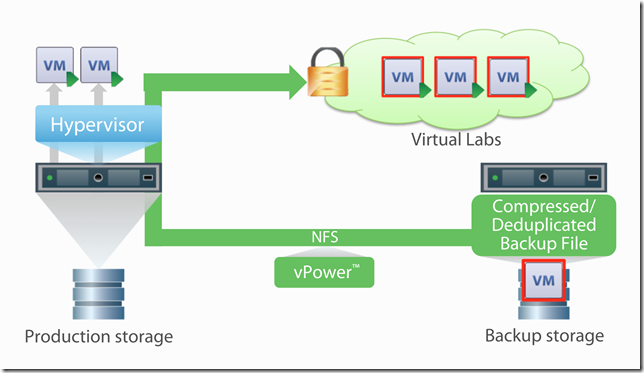 Virtual Labs has been around for a while now and is a staple for most Veeam deployments as it can automate the verification process on your backs so you can sleep peacefully in the knowledge that everything is consistent and that in the event of a failure you have backups which have been tested and are known to work. This has only been available for backups in the past. Now that Veeam is moving more toward a full DR solution as well it is necessary to provide a method to automatically test the consistency of replica VMs. This feature is only available currently with VMware but not doubt over time it will be made available to Hyper-V. This is something I’m definitely looking forward to getting my hands on as I already have clients request it. Veeam has integrated with some variants of HP storage to allow Backup from Storage Snapshots which greatly reduces the overheads required to capture a snapshot by offloading all the heavy lifting to the storage array. This offload makes the snapshot capture up to 20x times faster than normal snapshotting technology and reduces the overhead on your production VMs by reducing the VM I/O requirement for creating a snapshot and minimize the impact on the VM and the host. 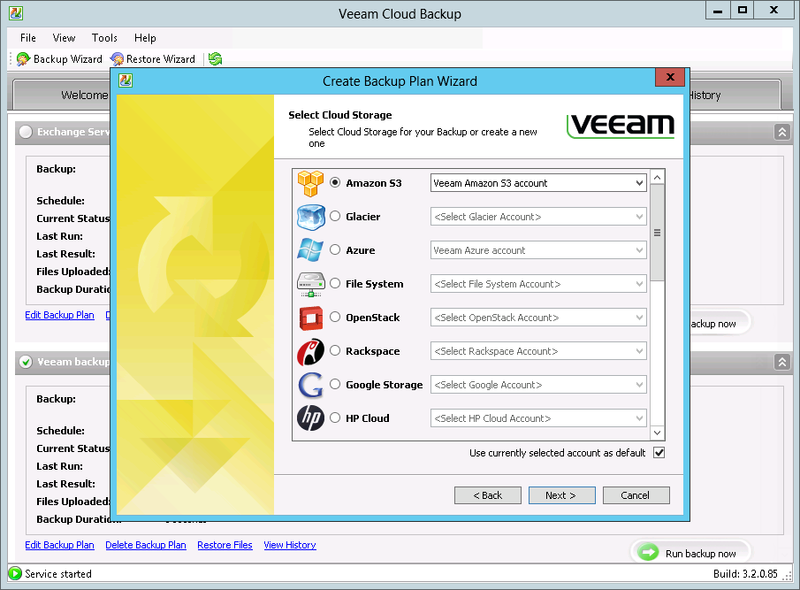 This sort of feature has been available on enterprise-class backup solutions for a few years now but Veeam has added it to it’s arsenal for currently only HP based storage. They are working with other vendors so we can expect to see this expand over time. This new feature links in nicely with Veeam Explorer for SAN Snapshots released last year which allows you to crack open a SAN snapshot to easily recover data. The WAN acceleration is a proprietary Veeam feature that was designed to push Veeam backup files to the cloud or to a hosted DR site. It works as a source-side deduplication device that ensures that any blocks that have been sent across the link already do not need to be sent over the wire again during backup. 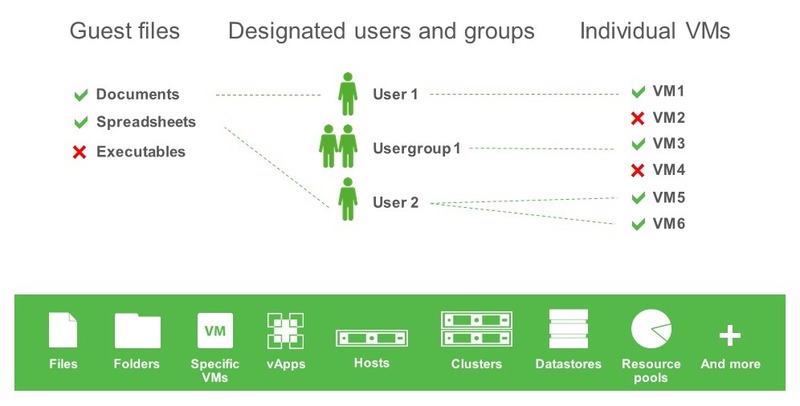 Veeam estimate that this will improve the performance of off-site data copy by up to 50x. This remains to be tested in the wild and it will be really interesting to see what sort of performance can be achieved with the WAN accelerator, but any way to increase the off-site data transfer speeds is a winner in my book. Even a 5x increase would be great. All you need to get WAN acceleration in place is an accelerator configured on each side of the WAN link and away you go. Increased data transfer speeds in the usual Veeam keep-it-simple way. Unidesk’s patent-pending desktop layering technology combines the management simplicity and storage efficiency of non-persistent, stateless virtual desktops with the modern, customizable user experience of persistent desktops. Unidesk desktops boot off of a virtual C: drive made up of independently managed, cleanly separated “layers.” IT uses Unidesk to create single pristine layers of the Windows OS and standard applications. As end users use their desktops, their changes are automatically captured in personalization layers. Unidesk dynamically composes these layers at boot time into unified storage. Workers get desktops they can fully customize. IT gets desktops that are easy to provision, patch, and repair. Unidesk Composite Virtualization™ technology dynamically combines the OS and app layers created andassigned by IT with each user’s personalization layer. IT can provision, patch, and update all desktops bysimply updating a layer once. None of IT’s changes affect the local profile settings, user-installedapplications, and data in the personalization layer. Because Unidesk operates between the hypervisor andMicrosoft Windows, anything can be a layer, including the OS itself, system services, and kernel-mode apps. Unidesk exceeds the capabilities of profile management, application virtualization, storage optimization,and PC configuration point tools with one, unified solution that minimizes VDI cost and complexity. Unidesk software integrates quickly with your existing VMware vSphere infrastructure, connection broker, directory, and storage. 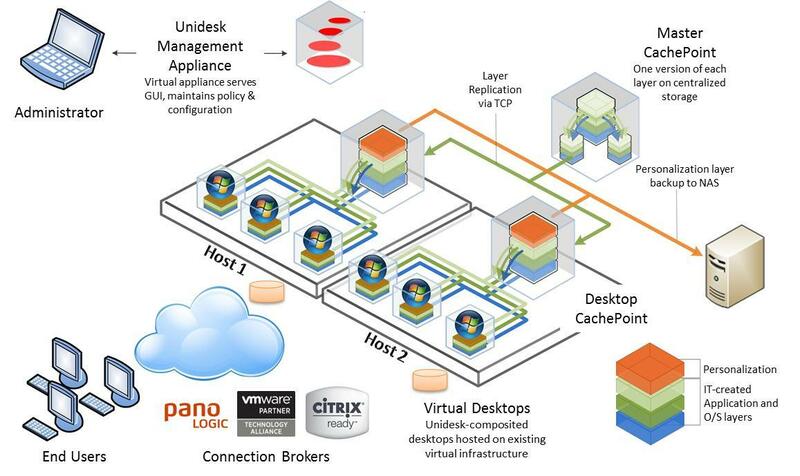 Unidesk consists purely of virtual appliances – no additional hardware is required. One VMware ESX™ (VI3™ or vSphere™) host, connected to VMware vCenter Server. 100GB of centralized or local storage. Unidesk’s automated Personalization Layer replication protects all desktops from local host or local storage failures. Microsoft Windows XP or Microsoft Windows 7 as your desktop operating system. Microsoft Remote Desktop Connection (free with Windows) or any connection broker. In the last part of the series we are going to focus on Configuration Manager 2012. The guys in the Configuration Manager side of the house have been busy working on addition features for Service Pack 1. When Configuration Manager 2012 was originally released back in April 2012 there were rumblings of the new Windows 8 platform but support was not originally available. Since then the up-take of Windows 8 has increased and BYOD has become the latest must have feature of any IT department. Allowing Configuration Manager to support the changes in Intune licensing is going to assist greatly in the BYOD sphere. Now that service pack 1 is available for System Center we believe that the growth of both System Center, Server 2012 and Windows 8 will begin to increase. A lot of administrators and decision makers will normally wait until a service pack has been released on a Microsoft product before make the move. We can see great growth over the coming year for Microsoft, and it will be really interesting to see what will happen in the virtualization sphere with Hyper-V as it now takes the battle to VMware. Will 2013 be Microsoft’s year? Operations Manager is one of the most important but quite often overlooked elements of System Center. We will go through the latest enhancements that come with Service Pack 1 and information regarding the upgrade process can be found over on Kevin Greene’s blog in his two part series, Part 1 and Part 2, which details the process substantially. Once again it’s a must read before any upgrade takes place. There are new features within Operations Manager that are only available if the underlying operating system is Windows Server 2012. Microsoft recommend on their Technet site to install the upgrades for System Center SP1 first and then implement the upgrades for the operating system to Server 2012. Many of the new enhancements are geared towards developers and monitoring of applications. The inclusion of support for Windows 8 and Server 2012 should now make the decision to upgrade to those platforms easier for administrators as they now have the comfort of knowing that the can monitor them successfully. In the next part of the series we’ll look at the new enhancements to Configuration Manager 2012. Microsoft have just released SP1 for System Center 2012. 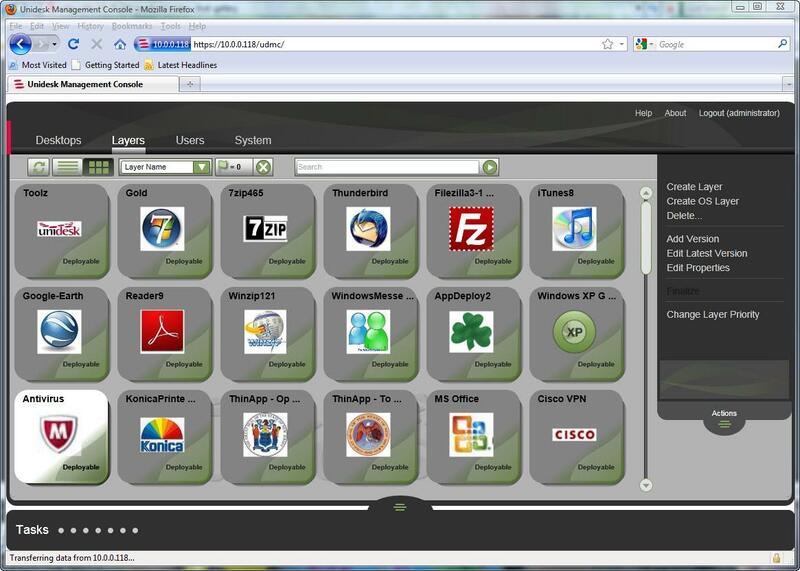 Unlike previous version of System Center, 2012 is a cumulative update for all products under the System Center umbrella. The upside to this is that all products are kept on the same version which makes the updates easier to rollout and keep track of. The downside is that products need to be updated in a specific order. In the next part of the series we will cover the enhanced features that have been upgraded as part of the new service pack, and also take a more in-depth look at the upgrade process. To begin with we will look at the order for upgrading the products within System Center. If you are using two or more of the System Center products you will need to follow up upgrade sequence otherwise you may experience issues with integration and communication between the various components in System Center. If there is only one product installed then you can proceed to upgrade that product without following the upgrade sequence. Technet Excerpt: Except for VMM, which requires Windows Server 2012, it is assumed that no other operating system upgrades have taken place before or during this upgrade. Upgrade the various System Center components before you upgrade the operating system. In addition, we assume that no upgrades to SQL Server have taken place. You can upgrade to SQL Server 2012 after you have upgraded your System Center components. There are two possible issues to be aware of with the upgrade path. These relate to Orchestrator and Operations Manager. Integration Packs installed in Orchestrator 2012 will no longer function with SP1 components. It is recommended to leave the current Integration Packs installed so that current functionality continues. After you upgrade the subsequent System Center components the Integration Packs will be un-installed and you will need to return to the Orchestrator server and import the upgraded Integration Packs for SP1. Some new features for Operations Manager are only available in Windows Server 2012 so if you need to upgrade to 2012 wait until the SP1 upgrade has been put in place and then upgrade to Server 2012. Windows Server 2012 is a big change for administrators when it comes to managing their infrastructure. It brings with it a bunch of new features that make management and deployment of services both more efficient and easier. A big change with Server 2012 is the use of powershell, which is something we will write a Did You Know article about soon. Just getting around the GUI for Server 2012 has also changed quite a bit. Below are a list of shortcut keys that will make getting around Server 2012 a lot easier. Veeam are currently offering a free 10-socket license of Veeam (nWorks) Management Pack for new Veeam MP users who are using System Center Operations Manager 2012. This fantastic offer allows customers to officially license and get maintenance support for up to 5 (2 socket) ESX hosts. This is a substantial offer for any small/medium sized business. More information on the off can be found here. I would recommend anybody that has System Center Operations Manager 2012 in their environment to leverage the knowledge base already collected for System Center Operations Manager to monitor their VMware environment efficiently and effectively. Veeam Management Pack provides built-in intelligence to increase productivity and reduce the learning curve for front-line operations staff. It also delivers instant value with hundreds of out-of-the-box rules, monitors, topology diagrams and reports on VMware performance and events while lowering administration and deployment overhead through centralized management and configuration. The management pack includes enterprise-class features such as high-availability, load balancing and a distributed, scalable architecture. 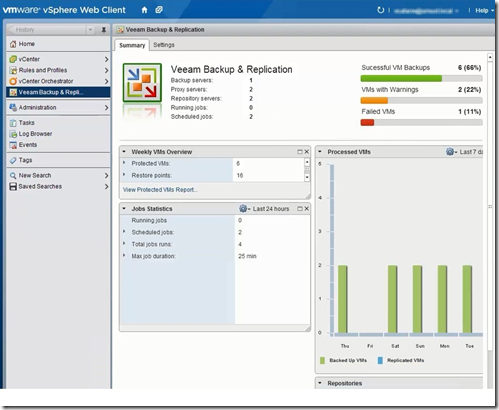 Veeam Management Pack leverages native vSphere APIs to gather its data.